Before 1883, there were some private schools financed by subscriptions and tuition, but in June of that year, a "school meeting" was called and a joint stock company was formed with a capital stock of $2,500 for the purpose of erecting a school building. J. Waggoner was elected to take charge of the school, which was to be known as Temple Academy. Before the building was completed, however, the town held an election and the vote was unanimous in favor of assuming the complete control of the schools. A special tax was voted and on December 26th, 1883, the school building was purchased from a stock company for $4,392.27. This first Temple school building was a barn-like structure located on Main Street and Downs Avenue. Professor J. Waggoner was elected as the first principal. It remains interesting to note the frequent turnover in management of schools between 1884 and 1893. The seven men elected during this period were B.M. Howard, E.I. Hall, J.E. Murray, J.A. Patton, E.P. Tarrant, W.T. Hammer, and J.E. Blair. Despite the frequent changes in management, the scholastic population grew so rapidly that in 1889, a two-story wing was added. Also in 1889, the school received affiliation with the University of Texas, leading to the first graduation class to receive diplomas in 1890. The Class of 1890 consisted of three graduates -- Alice Robbins, Kate Sloan, and Ray Wilcox. In 1894, bonds were issued for $22,000 and a new building known as Central High School was erected on the site of the original building. At this time, the 11th grade was added to the high school, placing it on a par with the best in Texas. For the next two decades, this building housed grades five through 11. A three-story building was erected at First and Third Streets between Downs and Elm Avenues. This building became overcrowded to the extent that two wings has to be added in 1925-26 to provide more classrooms and study halls, as well as an auditorium and cafeteria. In 1928, Temple embraced the junior high school development with the high school becoming a three-year school with grades 9-11. 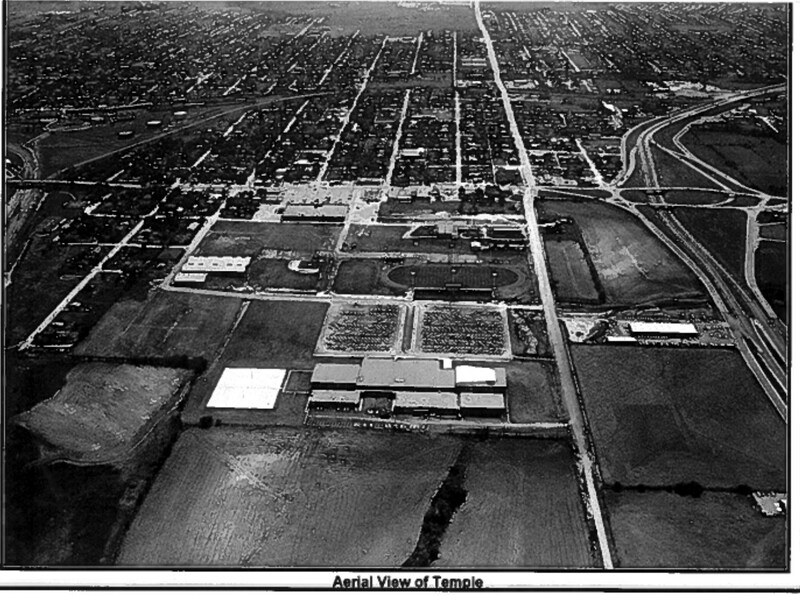 Then in 1939, when Temple joined other Texas cities in going to a 12-grade system, grades 10-12 were held in Temple High School. However, because of an overabundance of elementary pupils in 1945, Temple High School became of a four-year school again, a condition that had to be tolerated until Lamar and Travis Junior Highs were opened in 1956. 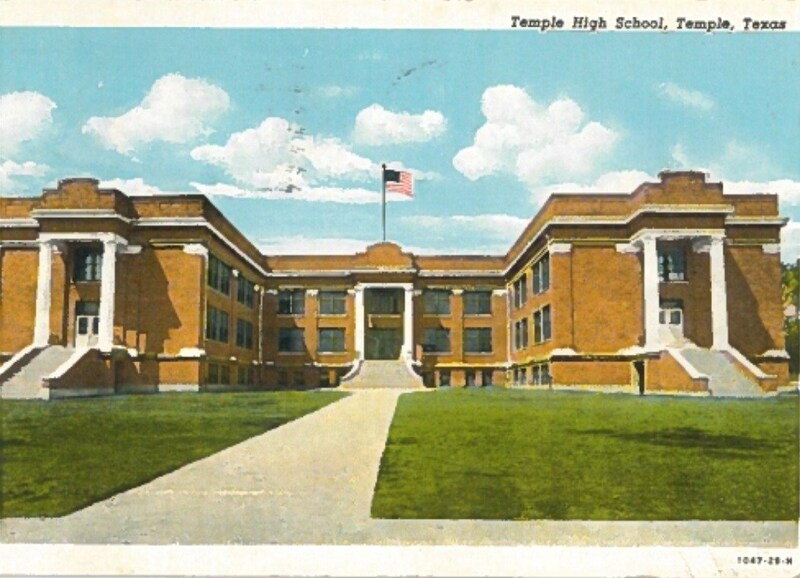 In 1965, the old Temple High School building was replaced by a new building costing $2,900,000. It was a gala dedication on September 10, 1965, with main speaker Waggoner Carr, as well as ribbon-cutters Board President Reginald Evans, Superintendent Ace Alsup, and Principal Calvin Whatley conducting tours. In 1968, Temple High School became the city's only high school with the integration and closing of Dunbar High School. Consequently, as the student body increased, more space was needed. The need for more vocational arts meant a need for a building to house it. Then, when it was decided to house four grades (9-12) in Temple High School, more classrooms had to be furnished, leading to the building of the L-Wing for the 1975-76 school year. The need for additions and renovations became a necessity again in the early 1990's. In April 1996, voters passed the $38,385,000 Bond Facilities Program Election, which led to adding a connected 9th-grade Center and cafetorium, renovating the existing auditorium and adding technology infrastructure. Also included in the four propositions were funds for athletic facilities, focusing on establishing equity for both boys' and girls' sports which led to rebuilding the entire home side of Wildcat Stadium, expanding athletic fieldhouse facilities, building a new gymnasium, as well as a girls' softball field, dressing rooms, office and storage space.